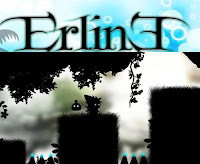 Erline is a platformer action game from frozennn in which your goal is to rescue a lost god. A very long time ago, the gods of Aurla created the magic portals that contains evil far away in the labyrinths. Now the creatures have escaped and Erline, the last god is lost. Take control over two characters that have different powers. The smaller guy can move things while the bigger one can control a magic orb. You must work their abilities together in order to rescue the missing Erline. Meanwhile, here is Erline walkthrough for those who need it.